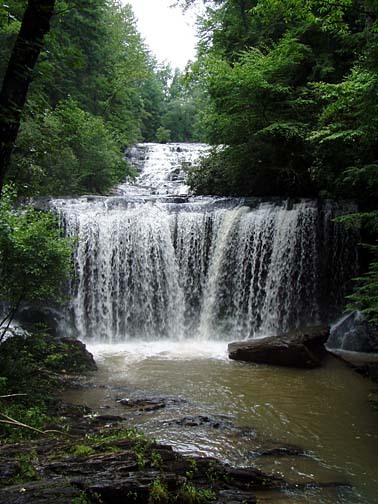 Brasstown is a hidden gem in Oconee County, South Carolina. The only drawback is each falls has to be viewed separately. 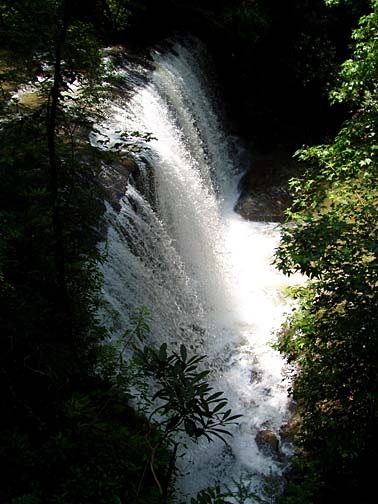 Pictured above is the Brasstown Veil and Cascade. The trail is steep, rocky and contains lots of roots. 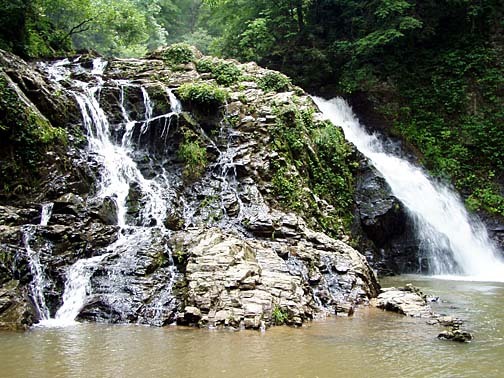 Plan on spending an hour or two climbing into and out of the gorge and visiting the falls. Directions: From Westminster, take US 76 for about 12 miles. Turn left onto Brasstown Road (not Brasstown Church Road) and follow for 4 miles. This road is narrow at times with no shoulders, and logging trucks use the road on occasion. Turn right onto the graveled, forest service road preceding the bridge over Brasstown Creek. Park at the end of the road at the rocks used to block jeeps and ATVs. Follow the trail for 100 yards through the meadow to a primitive Forest Service campground. 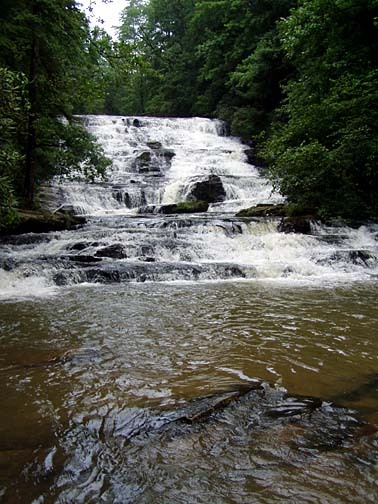 To reach Little Brasstown Falls, go to the left of the camping area and cross the stream on a fallen log or just wade across at a sandbar. 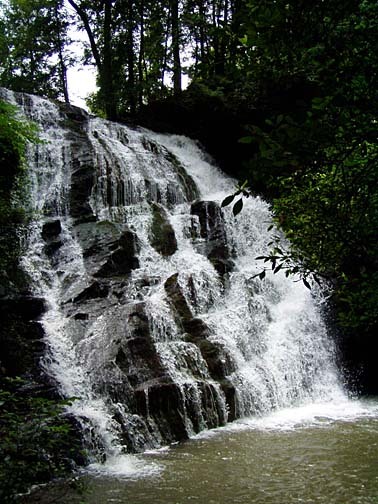 Pick up one of the paths and follow your ears to the small 30-foot falls. Re-cross the creek to reach the trail (if you want to call it that) to the other three falls downstream. Start out by descending to the right of the first campground. 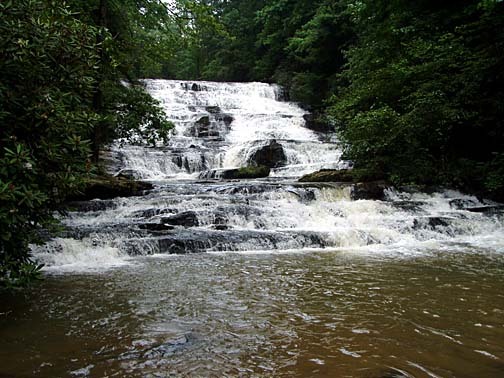 You will easily reach the cascades first, but it then gets tougher to reach the veil and the sluice. 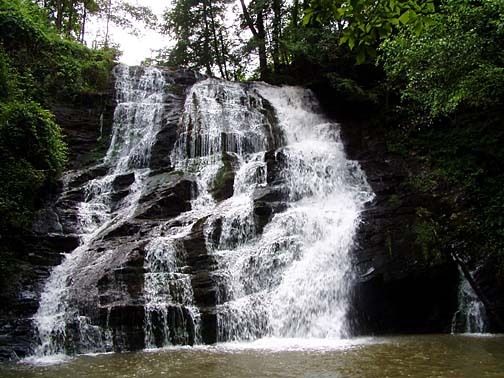 After viewing the cascades, it is safer to use paths further up the hill that stay away from the brinks of the veil and sluice.